Venezuelan authorities increased the number of physical education classes to three per week with six hours in total. The decision goes back to 2014, when a Consultation for Quality Education took place nationwide in Venezuela with more than 7 million people participating, including parents, students, teachers, administrators and stakeholders in general. The results led to a transformation in the curriculum that was in place since the 1970s, with some reforms in the late 1980s. Up to now the curriculum prescribed ninety minutes for grades one to three and 45 minutes for grade four and five. 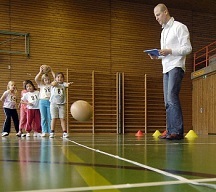 The increase of hours was accompanied by a review of the syllabus of physical education. Challenges will be the training of physical education teachers and the provision of facilities. Last year a pilot study took place in 80 secondary schools. Furthermore, the school day offers Participation in Groups of Interest, in which students can choose from science, arts, languages, music, recreation - and sport.